In this page you find the detailed explanation of some compartmental models, commonly used to describe the progress of an epidemic in a large population. Examples include simple SI and SIR models and more complicated and realistic compartmentalizations. Each example can be downloaded as an xml file and loaded in the GLEaMViz Simulator. 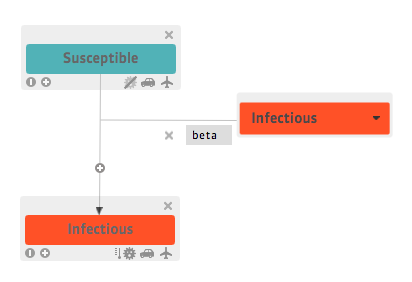 In the SI model each individual can be in only two states: susceptible or infectious. 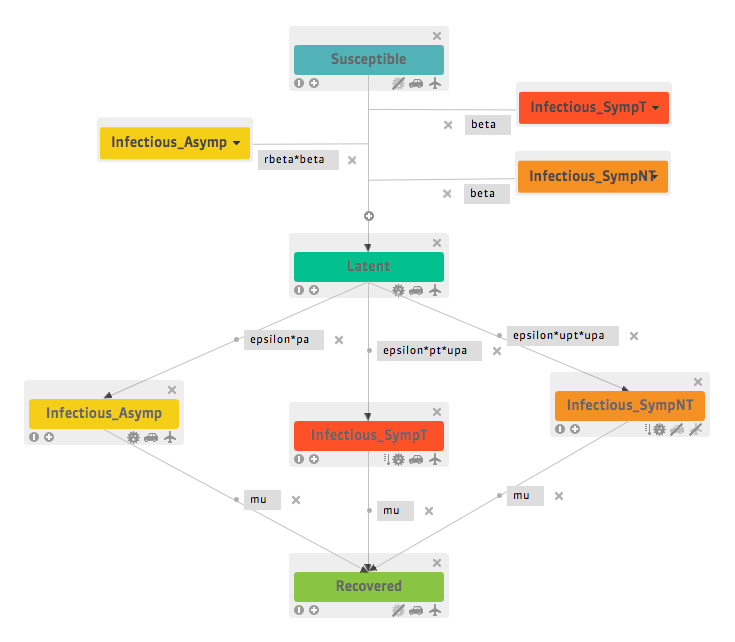 A susceptible individual in contact with an infectious person contracts the infection at rate β.
Download the model xml file. In the SIR model a susceptible individual in contact with an infectious person contracts the infection at rate β. Each infected individual remains infectious for a mean infectious period, denoted as μ-1, which here is assumed to be equal to 3 days. After the mean infectious period, infectious individuals recover permanently. 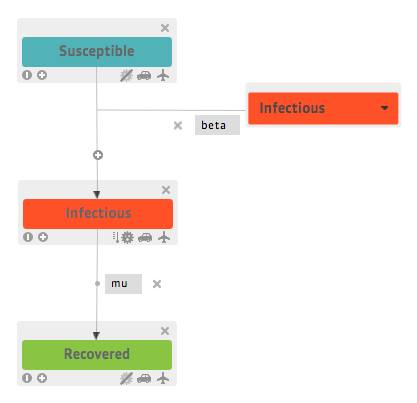 The SIS model describes those infections that do not confer any long lasting immunity. 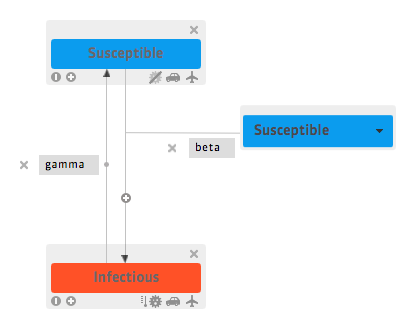 Such infections do not have a recovered state and susceptible individuals, after becoming infectious with rate β, become susceptible again, with a different rate γ. In the SEIR model a susceptible individual in contact with an infectious person contracts the infection at rate β. For many important infections there is a significant period of time during which the individual has been infected but is not yet infectious himself. During this latent period the individual is in the exposed compartment. 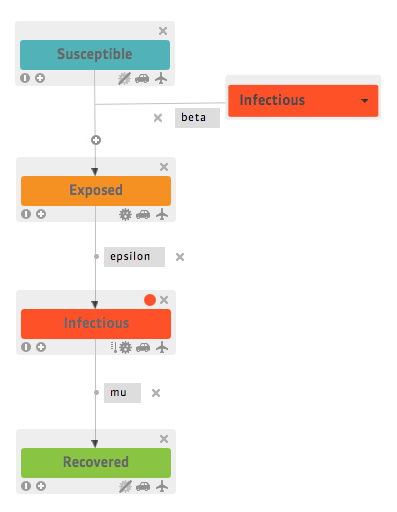 After the latency period, which is denoted by the variable ε-1and here is assumed to be equal to 2 days, exposed individuals become infectious. Then, infectious individuals recover permanently with rate μ.
D. Balcan, H. Hu, B. Goncalves, P. Bajardi, C. Poletto, J. J. Ramasco, D. Paolotti, N. Perra, M. Tizzoni, W. Van den Broeck, V. Colizza, A. Vespignani BMC Medicine 7, 45 (2009)A susceptible individual in contact with a symptomatic or asymptomatic infectious person contracts the infection at rate β or rββ, respectively, and enters the latent compartment where he is infected but not yet infectious. At the end of the latency period, each latent individual becomes infectious, entering the symptomatic compartments with probability 1 – pa or becoming asymptomatic with probability pa. The symptomatic cases are further divided between those who are allowed to travel (with probability pt) and those who would stop traveling when ill (with probability 1 – pt). Infectious individuals recover permanently with rate μ.